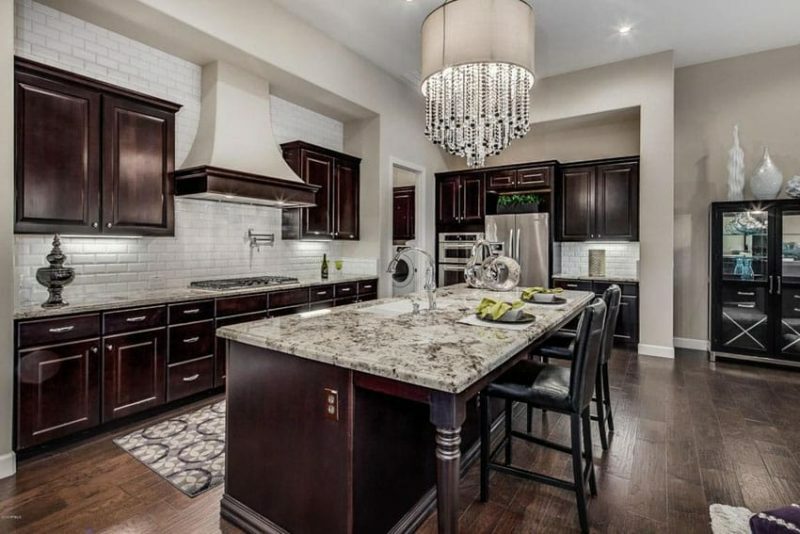 This gallery showcases beautiful solid wood kitchens with custom cabinetry and high-end natural stone countertops and elegant finishes. 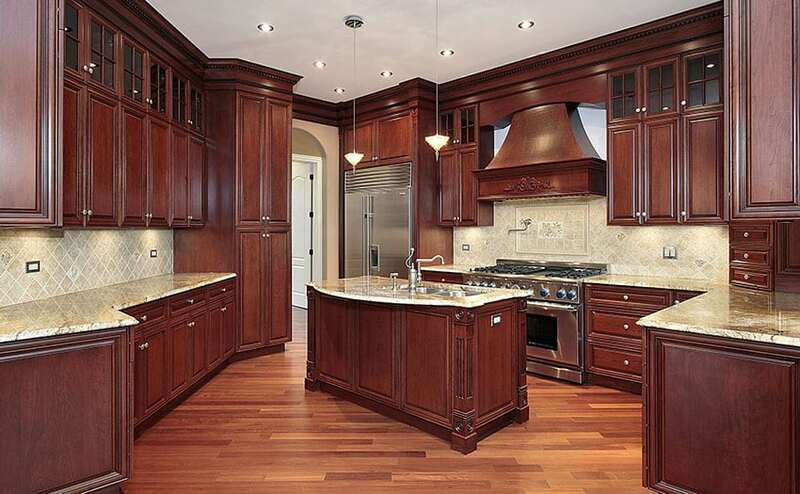 Hardwood cabinets are often constructed from alder, oak, cherry, maple, walnut, pecan, birch, or hickory. Solid wood cabinetry brings out natural characteristics that look stunning and are sure to increase your happiness while in your kitchen. 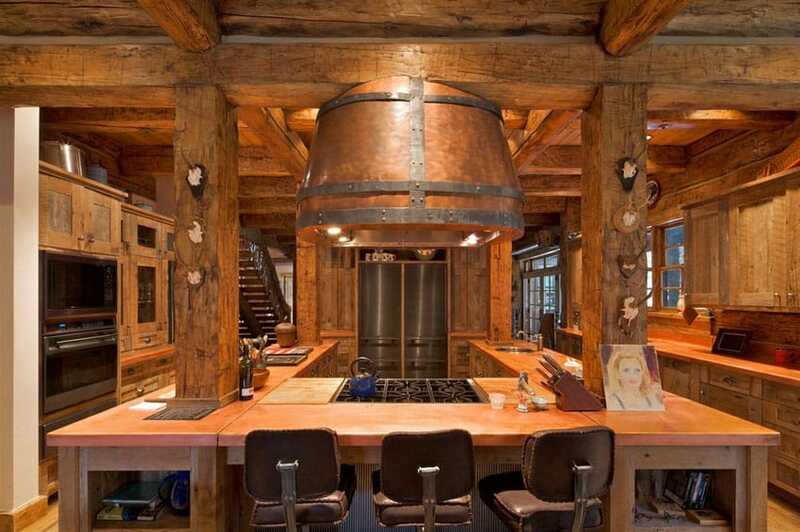 Rustic and Industrial qualities both combine to creating very interesting and gorgeous kitchen design. The cabinet design follows a simplified neo-classic template, with flute detailing and minimalist cornices, but with additional details which enhances its industrial appeal such as the visible nailheads and the black drop cabinet pulls. Giving it its rustic appearance is its natural wood finish, topped with a matte coating to emphasize the natural grains and color of the wood. 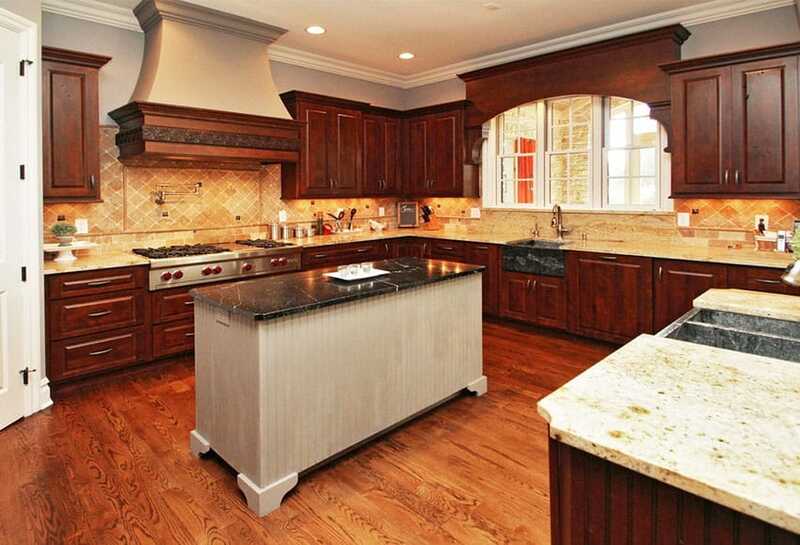 This full-sized kitchen used solid Cherry wood cabinets all over, with a classic neo-classic inspired design. The overhead cabinets maximizes the whole ceiling height, creating lots of storage and display space. Because of the strong red understones of the cherry wood cabinets, the countertop material used is yellow granite with matching yellow/cream ceramic backsplash tiles to help tone down the reds. This contemporary kitchen design emphasizes horizontal lines, by using horizontal solid teak wood planks for its cabinets. The teak wood lumber were varnished, enhancing its natural grains and color, then fixed with aluminum recessed drawer pulls for a more modern look. Adding a classic charm to this modern kitchen is its used of beige granite counters with a very polished surface. 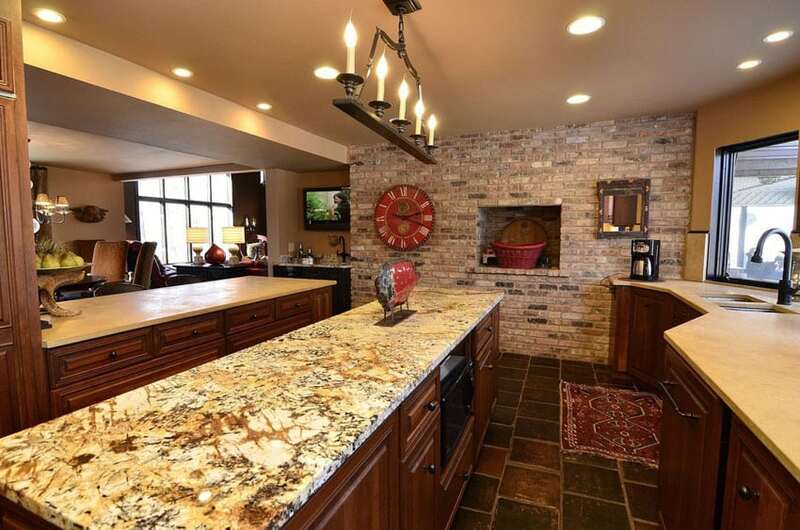 The brick wall in which the kitchen is placed against gives helps attract attention, making it the focal point of the room. This large semi-open kitchen design uses traditional style kitchen cabinets using solid redwood and given a light sheen with varnish. This is topped with gray soapstone counters, giving it a soft and elegant look. Adding to the charm of this kitchen are the plant accents above the overhead cabinets, as well as its semi-open layout. A full-size kitchen which has distinct yellow-orange tones due to its use of solid pine wood all-throughout the kitchen. The coffer ceiling uses pine wood, and even the kitchen cabinets uses solid pine. The warm colors are celebrated in this kitchen design. The countertop uses yellow granite, with matching yellow/beige ceramic backsplash tiles, giving it a softer and lighter tone compared to the solid pine cabinets. 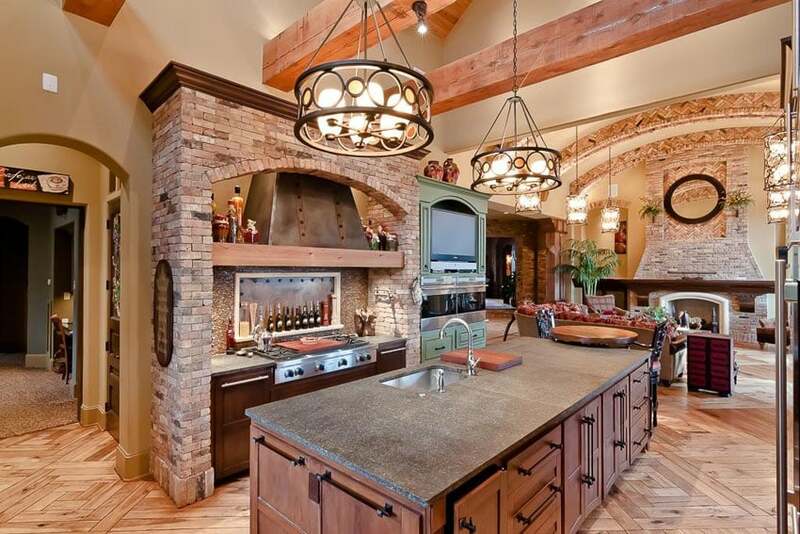 Rustic elements abound in this kitchen design. Wood finishes are kept raw and natural, emphasizing its natural beauty and finish. The solid wood kitchen cabinets are only lightly sanded, unstained and unvarnished, making its texture and a variety of wood tones pop out. The countertop is red-tinted concrete for a smooth and industrial style look. Aside from the kitchen cabinets, the while house itself has rustic elements and finishes, like the solid wood columns, beams and planks which keeps its natural colors and textures and were only lightly treated and varnished to protect it from termites and other natural elements. 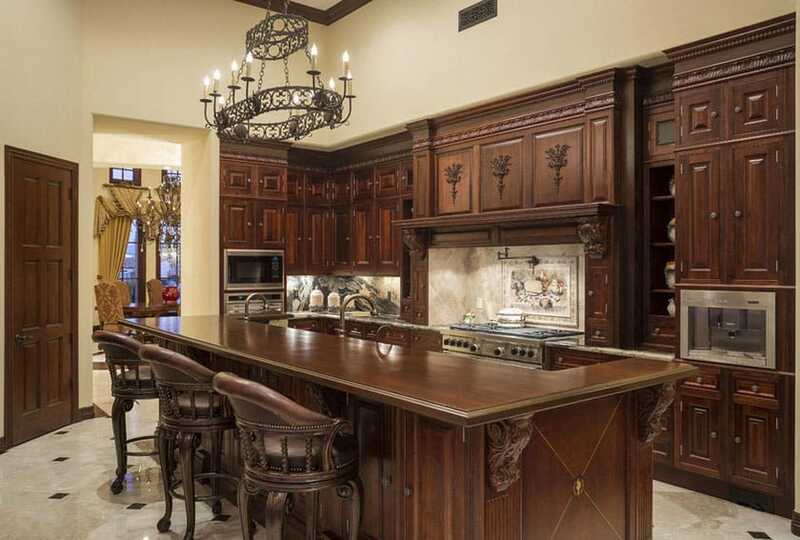 A large solid wood kitchen island offers breakfast bar seating and a built-in rangeand sink. 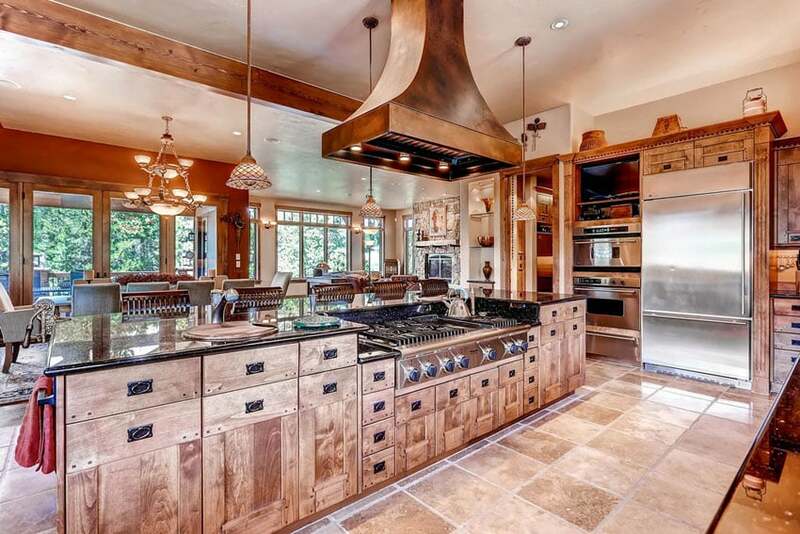 A rustic-inspired kitchen design, but this one has a more polished and modern appeal. 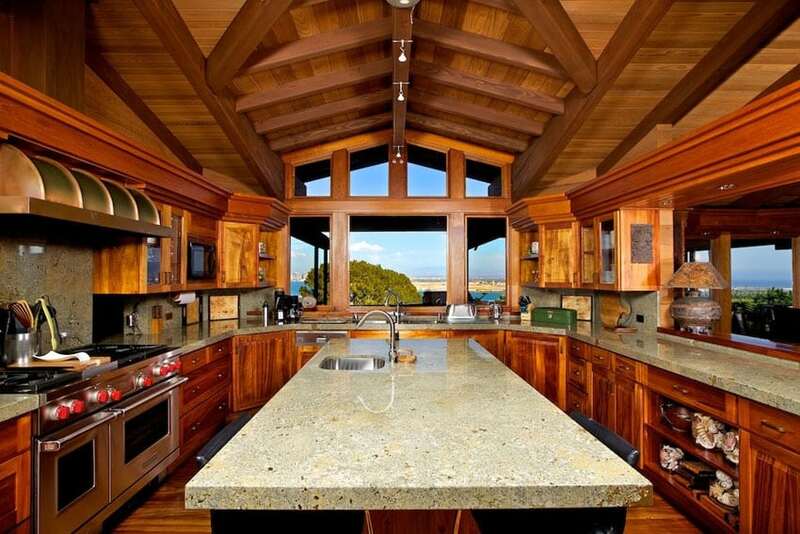 The kitchen cabinets are all in solid teak wood topped with varnish, making the dark wood grains stand out. The orange tones of the teak cabinets contrasts with the natural matte oak of used on the ceiling and wooden beams, creating a soft balance between different wood finishes. Since the teak wood cabinets already has a strong color, the counter top and backsplash material used was gray quartz, giving this kitchen a neutral surface. This kitchen has a modern transitional look, going for a darker color scheme. While the walls are of a nice light oatmeal color, the kitchen uses wengue-stained solid wood cabinets. The simple panel design makes it look timelessly elegant, making it look good in any style of interior. The white granite counters and the oatmeal glass subway tiles gives a nice contrast against the wengue cabinets, and makes it look balanced. Simplicity and elegance abound in this traditional style kitchen, featuring solid walnut cabinets with a matte finish, giving it that clean modern look. The straight, clean lines of the cabinet design gives it a more modern and masculine appeal, especially since the kitchen island uses charcoal soapstone countertop. The main counters goes for more earthy tones, using olive granite counters and brown mosaic tiles for the backsplash. 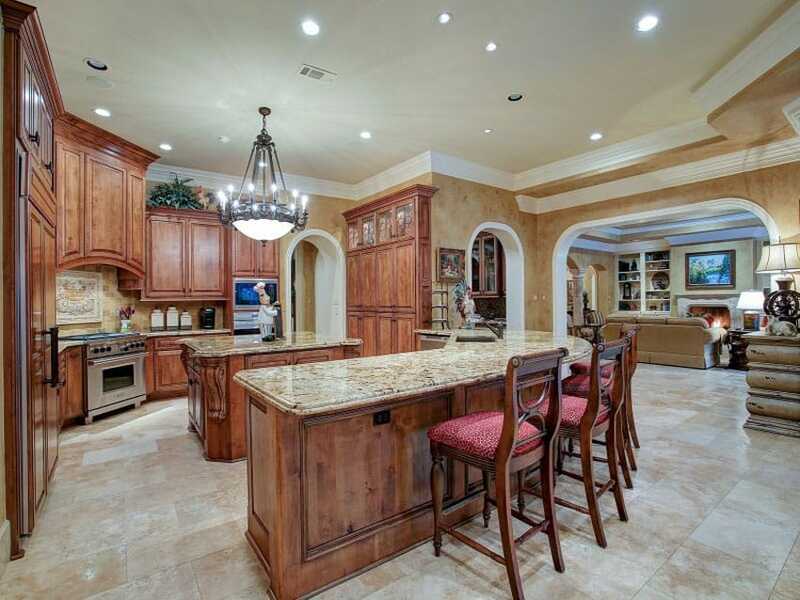 This kitchen definitely demonstrate classic elegance of traditional style kitchens. You will see lots of period-style motifs on the carvings and detailing of the kitchen cabinets, and elegant finishes and accents. Dark oak wood was used for the cabinetry and topped with white granite and ceramic tiles for the backsplash. The large kitchen island has two-level surface, one of which is made of solid dark oak as well, used for the bar and the lower surface is for the preparation area. 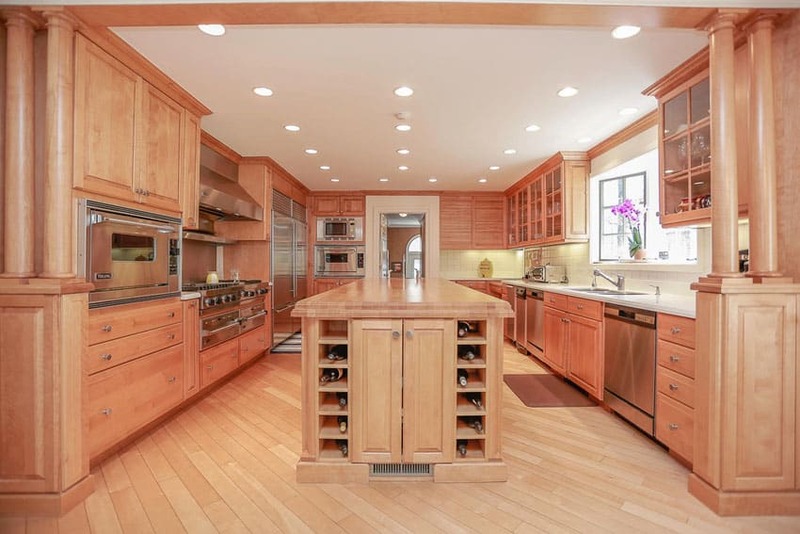 Putting emphasis on the natural beauty of wood, this kitchen uses solid wood cabinets sainted in golden walnut color and varnished to perfection. It creates an elegant color scheme, combining blacks with the wood tones and some light cream colors for balance. There’s an L-shape kitchen island in the middle with round bar wooden bar stools with black leather seats, matching the combination of wood and black granite of the kitchen island. A country-inspired kitchen design placed in a small space which uses solid beech wood cabinets. The lighter wood color helps to make the space look brighter despite the small space. This is combined with granite countertop with gold and yellow flecks, matching the over-all tone of the kitchen cabinets. The woven bar stools with bent rattan legs also helps give the space a more country vibe. This kitchen goes for an all-wood look, using like solid pine wood, and maintaining its natural color tone, it creates a bright and refreshing look for this full-sized kitchen. The wood is only lightly varnished with a matte top coat, making it look as natural as possible. For the countertop, white is the color of choice, while the kitchen island goes for an all-wood look, using solid wood butcher’s block counter top. 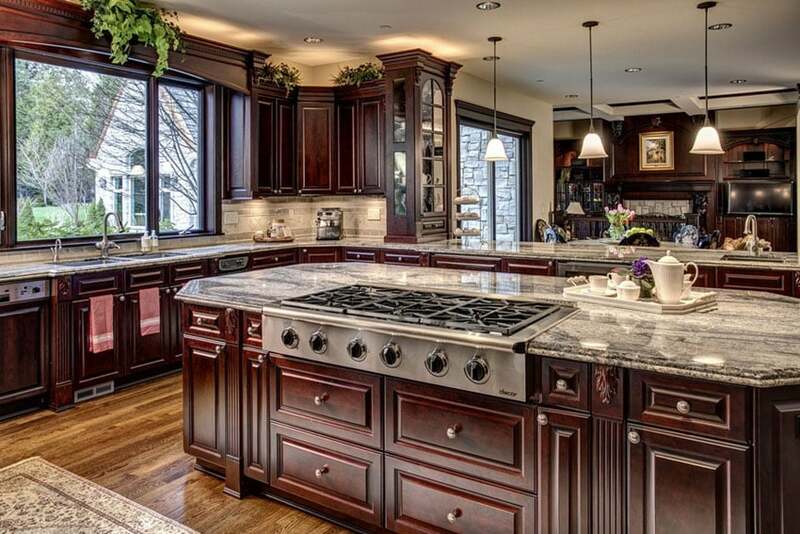 This kitchen is an embodiment of classic kitchen design, emphasizing contrasts and dark wood tones. In this design, the dark oak floors were paired with light warm gray walls for a balanced background, while the kitchen also combines a similar contrast for the surfaces. Solid redwood cabinets were paired with white granite counters and white beveled subway tiles for the backsplash. To add a bit of glamour, an accent chandelier was placed right above the kitchen island. 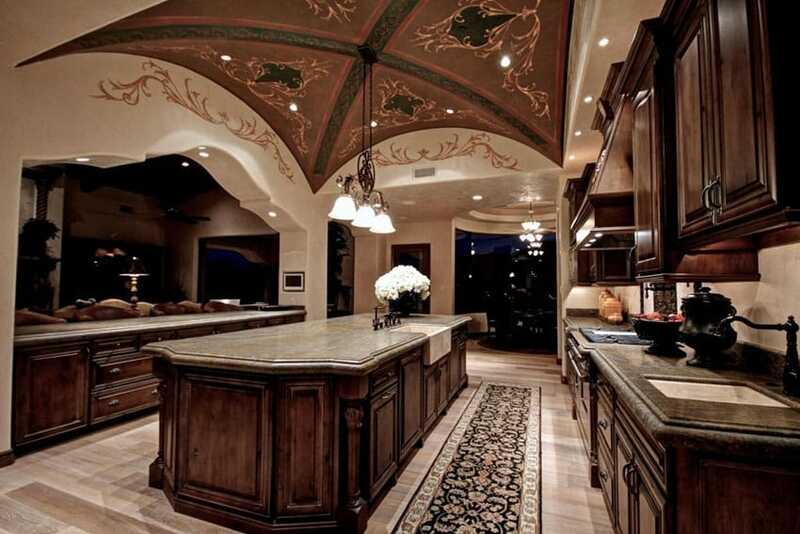 With a gothic-inspired ceiling mural design, the design of the kitchen cabinets also follows the same style inspiration. 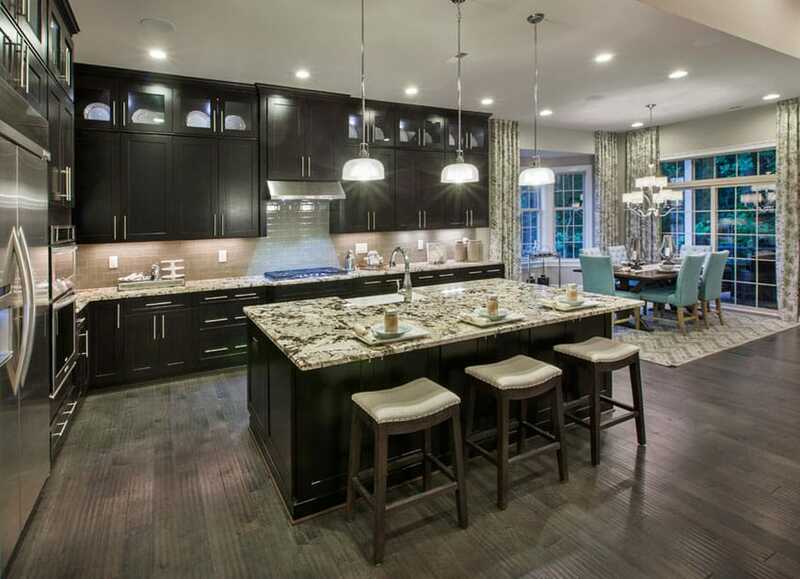 It uses solid dark walnut kitchen cabinets topped with ash-colored granite counters for that dark and rough look. The over-all ambiance has a mysterious feel to it, making it a perfect period-style kitchen. This kitchen goes for a more modern, transitional style kitchen design. 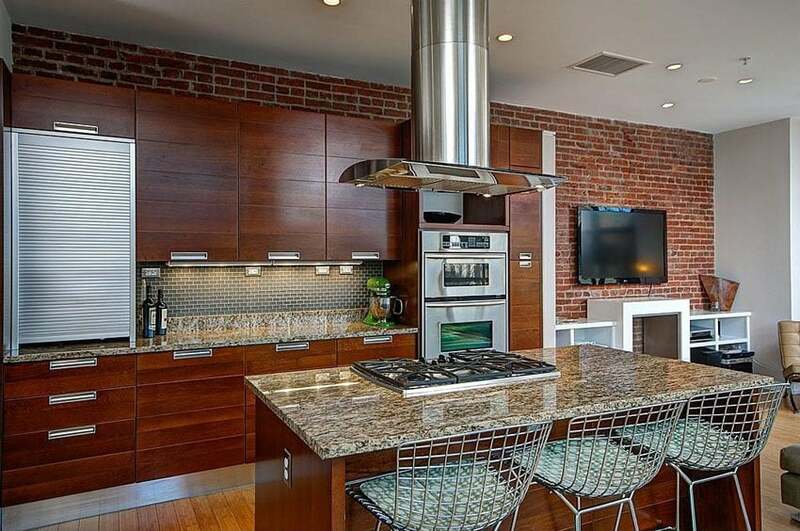 The floors of the kitchen are solid walnut paired with light brown walls. The kitchen cabinets are all made of solid with, in a combination of white-painted finish for the main kitchen cabinets and dark walnut for the kitchen island. All counters uses taupe colored quartz, making a unified look for this kitchen. 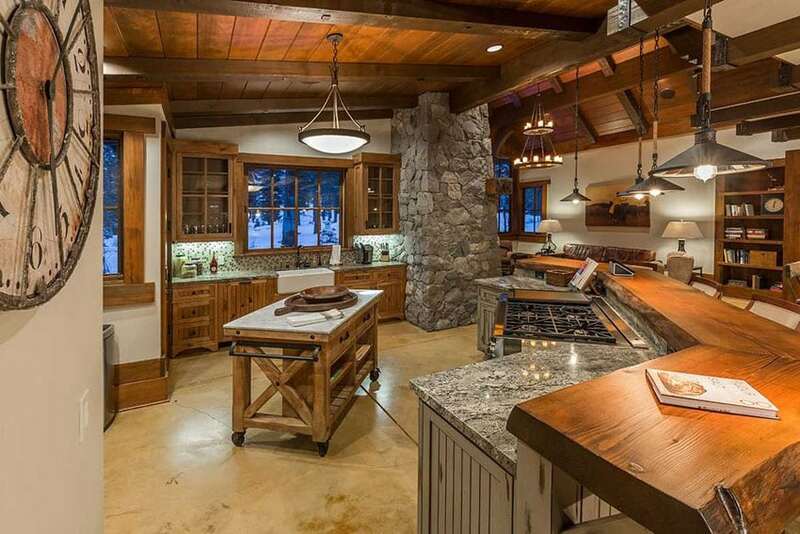 This open kitchen goes for a modern rustic look. It uses solid teak wood for the base cabinets, combined with industrial style custom drawer pulls/handles, and topped with dark charcoal colored satin finish quartz. The cooking area’s built-up side walls were finished with bricks, to give it that rough, rustic look, while the hammered iron cover for the range hood and the black iron chandeliers gives it that industrial vibe. 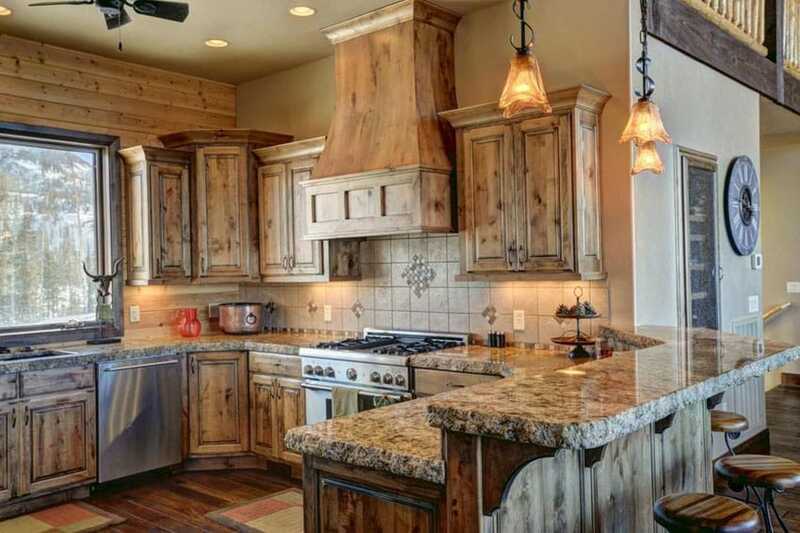 This kitchen goes for a more country, rustic vibe with its natural wood finishes and color scheme. 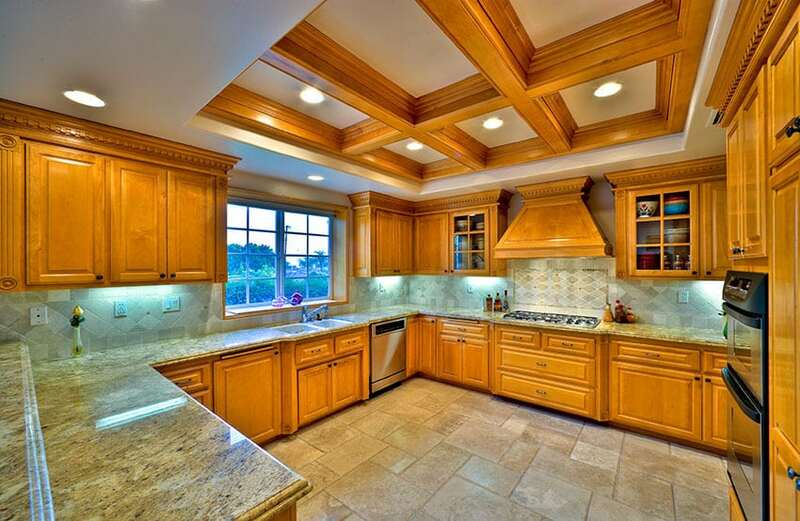 The beauty of the wood is emphasized in the kitchen cabinets, as its natural knots and grains are very much visible. This kitchen uses solid pine wood and stained in golden walnut color, matched with natural-cut beige granite, giving it a natural-looking rough edges. One side of the wall of the kitchen also has horizontal wood sidings, which uses the same pine wood and finish. To keep to the natural warm scheme of the other finishes, the walls are also using light brown color. 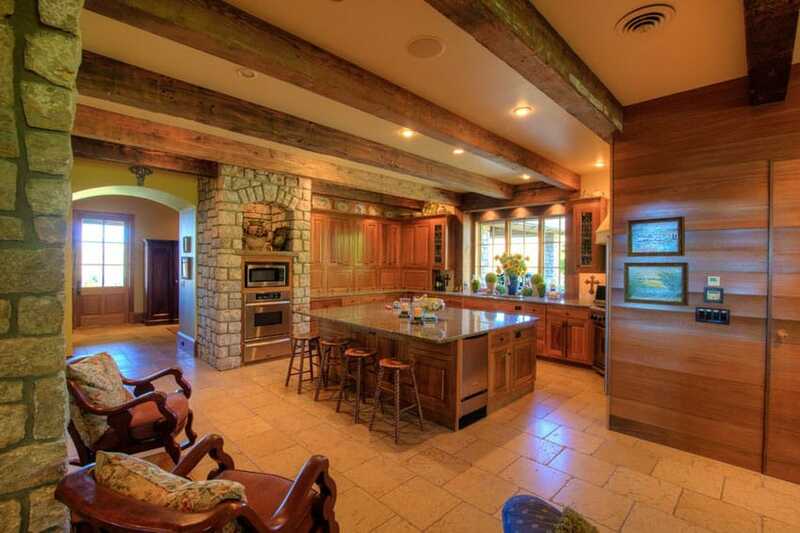 A rustic country kitchen which really matches the interior architectural details of the space. It has exposed wooden beams and planks on the ceiling, and large, masonry columns. To balance out the rough, natural finishes, the walls were coated in an off-white color. The kitchen cabinets placed against the wall uses the same wood as the window frames. The kitchen/bar island however, uses the same style of cabinets, but painted in a light gray color for a more shabby chic look. Both are topped with gray granite, while the to of the bar counter uses solid wood plank with natural edge. Another country style kitchen, but this one has a more polished, elegant look. The over-all ambiance is very warm and cozy, mostly due to the warm white lights used. The ceiling has solid wood beams in a zebrano color, while floors are natural stones in a running bond pattern. The kitchen cabinets are of solid cherry wood, giving it a nice orange tone, and topped with gray granite to help neutralize and balance the colors. 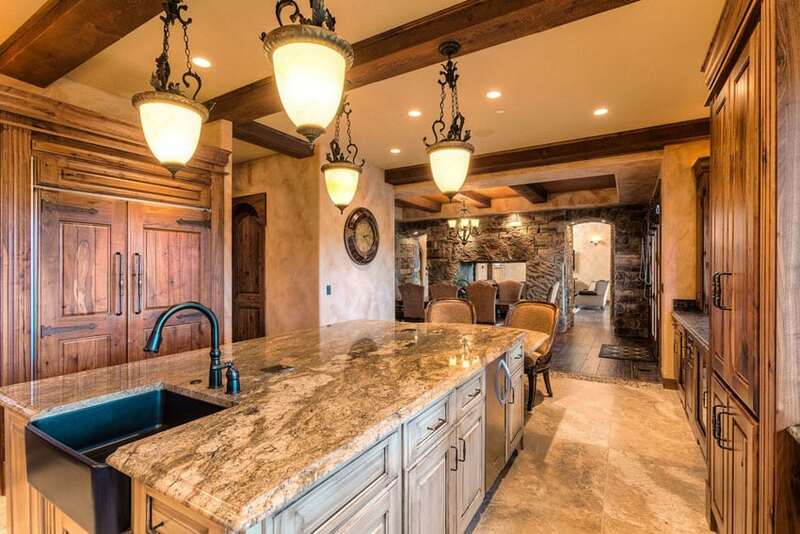 This is a traditional style kitchen placed in a very traditional-inspired interior space, adapting finishes such as marbled paint finish and masonry finish on walls. The kitchen cabinets are all solid wood, in a combination of dark walnut and ash wood for the kitchen island. 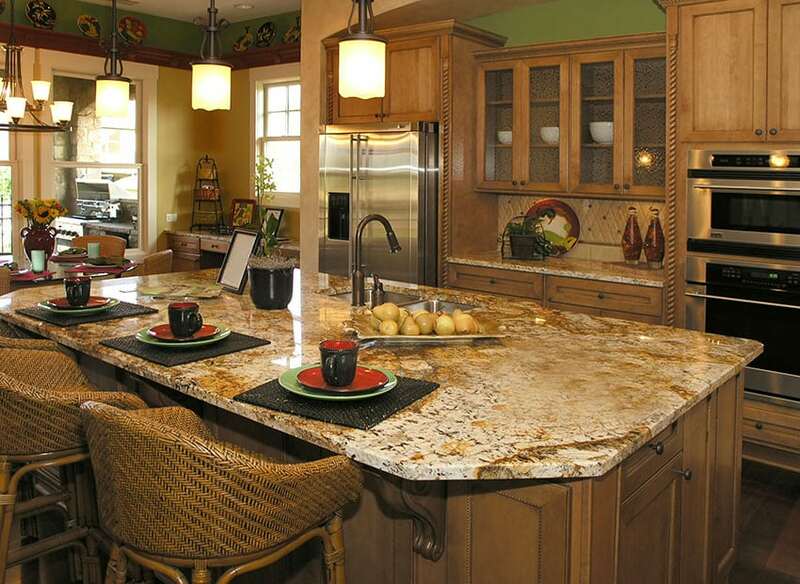 the solid wood kitchen island is topped with a beige granite countertop, basin sink and breakfast bar. The fixtures and door handles used in the kitchen are all in black, matching the black-painted iron on the pendant lamps, giving it a unified look. 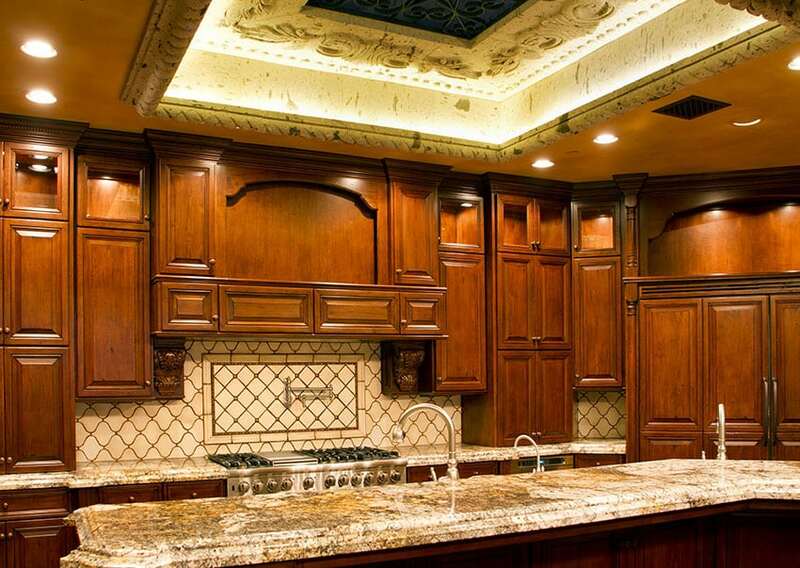 An elegant traditional style kitchen with paneled solid mahogany kitchen cabinets and brass cabinet knobs. You will also notice the coffer ceiling detail, with cove light accents and, relief plaster motifs and wrought iron details, giving it a very unique look. 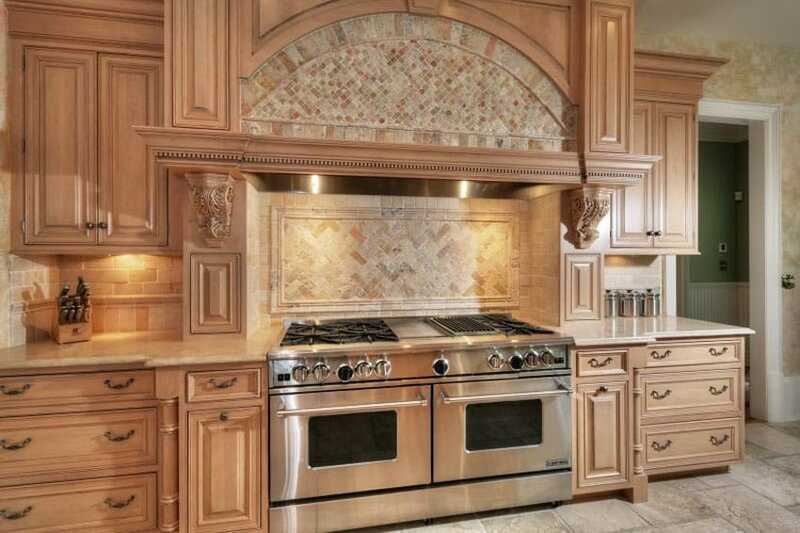 It also uses lovely cream arabesque tiles for the backsplash, adding a very elegant Moroccan pattern to the wall, which also matches well with the white and gold granite counters. This kitchen ha a red-orange tone due to the redwood kitchen cabinets. These paneled cabinets kept its natural color and was only lightly varnished, giving it a soft sheen. 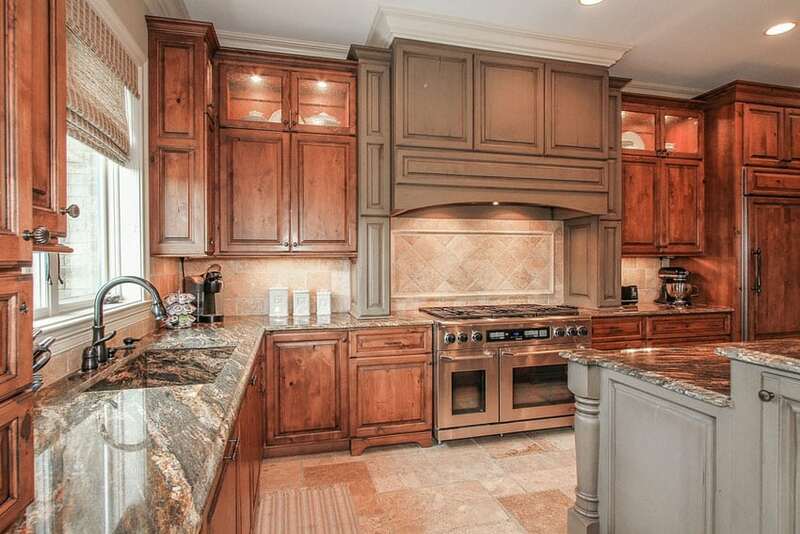 This was combined with gray antiqued finished cabinets, like the one surrounding the hood and the kitchen island. The two different finishes helps neutralize each other and create a more balanced look. Solid wood kitchens like this one with its small traditional style can benefit from a lighter color scheme to create a bright and refreshing cooking and food prep space. The kitchen cabinets are all solid maple wood, keeping its natural color and only lightly varnishing it. To match with the tone of the cabinets, a light cream granite was used on the countertop, while the backsplash used pale stone bricks. 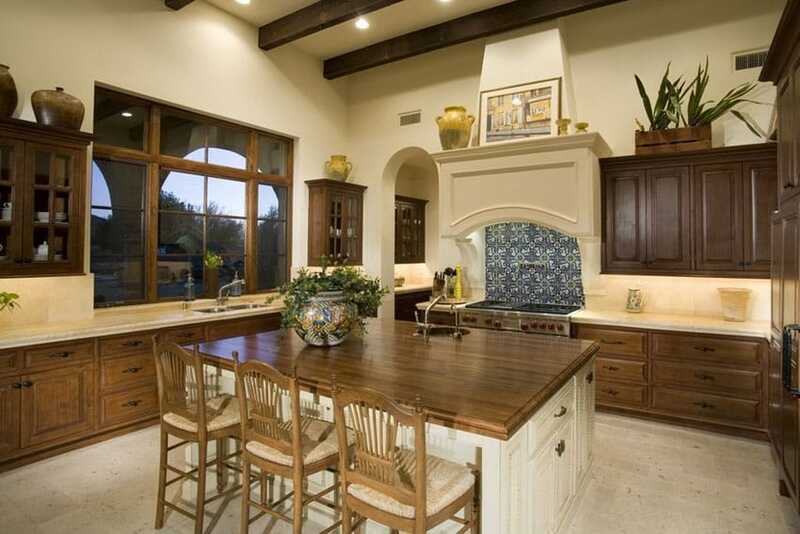 This is a nice full sized traditional style kitchen which has a good balance of plain colors and wood tones. Natural Oak cabinets were used, matching the window frames and topped with white granite countertop. The kitchen island is the opposite of the main cabinets, as it uses natural oak countertop, and white-painted cabinet base. At the ceiling are wooden beams in dark wengue, creating pattern and texture on its surface. This kitchen has a unique layout and some neo-classic details. It uses solid mahogany kitchen cabinets varnished to perfection. The main cabinets against the wall were paired with light taupe granite counters and backsplash, while the bar counters uses dark brown granite. To add a bit of contrast, the wooden barstools used were finished in dark wenge, making it pop out from the pure mahogany kitchen. 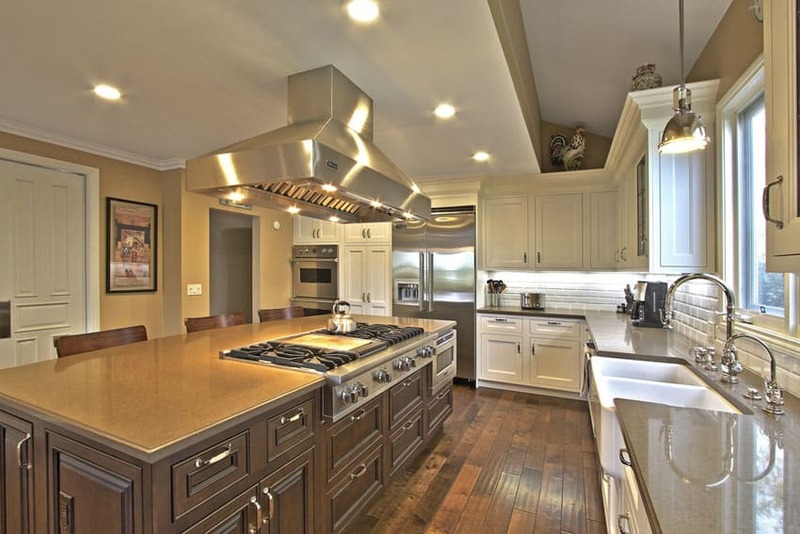 This kitchen uses solid beech wood cabinets, stained in a mahogany color and varnished to add a soft sheen to it. Since the main kitchen cabinets applies this Mahogany color, the countertop used is light yellow granite, to help balance out the dark tones and reds of the wood. The kitchen island, however, uses a taupe-painted base with black marble countertop, making it look unique from the rest of the kitchen. 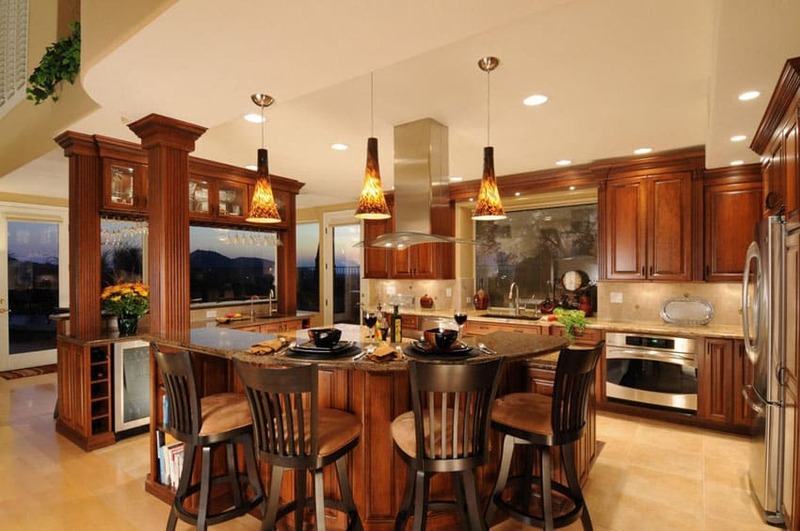 Custom solid wood kitchen cabinets often use walnut because they are both beautiful and durable. 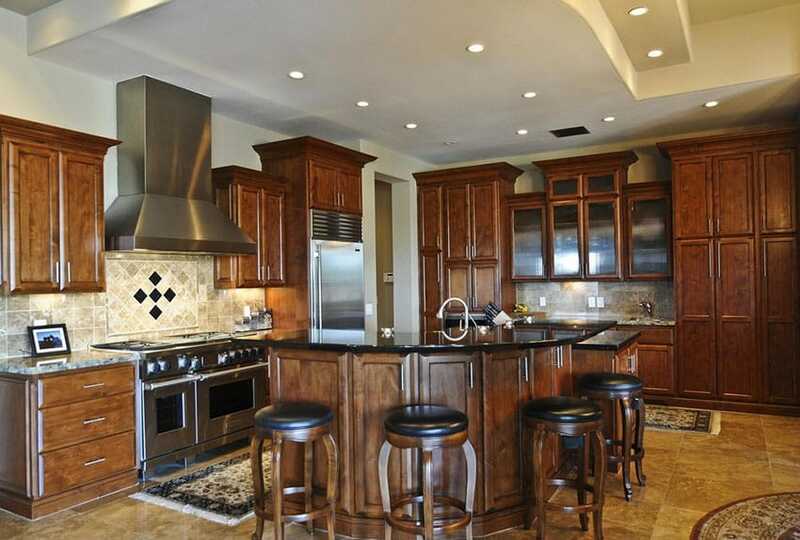 This traditional style kitchen uses elegant golden walnut kitchen cabinets topped with yellow gold granite counters. The soft orange tones of the wood give a natural warm glow to the kitchen space despite its use of bright pure white lights. There are also barstools which matches perfectly with the kitchen design. 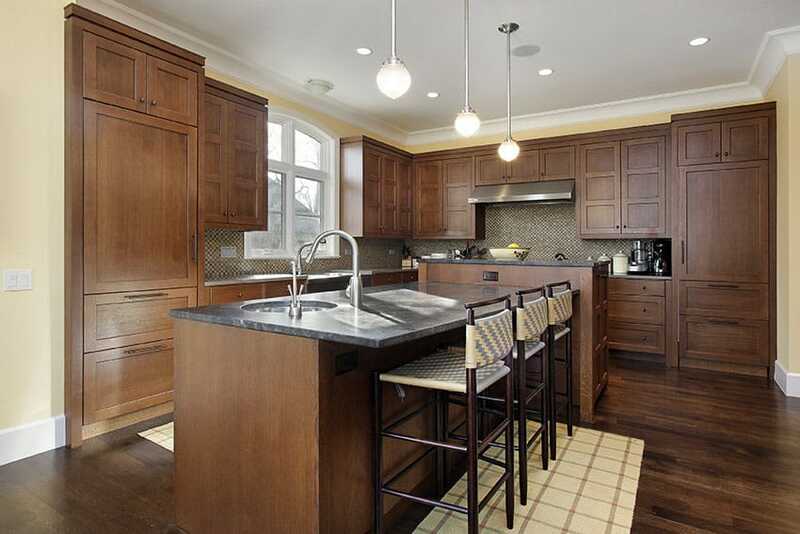 This is a fairly large open plan kitchen with three parallel kitchen counters. Going for a classic elegant look, it uses light oak paneled kitchen cabinets with beige quartz and cream soapstone counter tops. To help maximize the amount of natural light coming into the space, no overhead cabinets were used, creating a lighter and more airy feel into the kitchen. The 3 parallel base cabinets more than makes up for the storage space lost on the lack of overhead cabinets.